Toddler refers to child from one to three years of age. It is a great time for physical, motor, intellectual and social development for a child. Now as your child starts socializing, you also get to see a lot of other kids and then starts the process of thinking... is my child different from the other kid? and let me give you a simple answer for that 'Yes! Your child is different from any other child and so are other children from each other.' Each child needs to be handled keeping in mind who he/she is. In 60s and 70s, the toddlers were either "Easy" Child, "Difficult" Child or "Slow to Warm Up" Child. 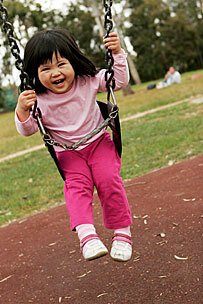 The "Easy" Child is cheerful, social, tolerates change well, has predictable eating and sleeping routines. Parents should ensure that they do not neglect the easy child since he/she adapts to any situation with ease and often go unnoticed and easy to ignore. The "Difficult" or "Spirited" or "Spunky" Child is strong willed, rigid and impatient. They often need to be engaged in some or the other activity to burn their energy and keep them from getting into something not so desirable. The "Slow to Warm Up" Child needs more time for transition from one activity to another and does not take strong or harsh criticism easily and can become more introvert and fearful. Avoid rushing them into any new activity and let them take their time to get accustomed to change. Having said that, your child may not clearly fall in any one of the types and may behave differently in different situations but that is absolutely acceptable. Will talk about these personalities in next few posts... keep reading and share your parenting experience!